The ADS1 utilizes an air venturi-activated suction to pick up the solid hot melt adhesive from a bulk container and convey it by air pressure to the hopper. The ADS1 automatically replenishes adhesive to the desired level in hot melt equipment and will easily integrate with competitive equipment configurations. Out of the box installation with drop-in adhesive tank connection. A low level indicator sends a signal that adhesive is needed. 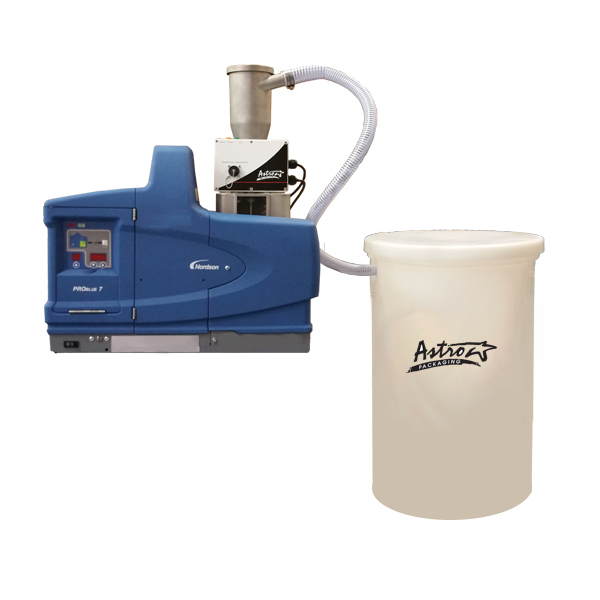 The ADS1 Auto Feeder then activates a positive pressure suction that draws the adhesive and deposits it into the hot melt unit. If the operator does not refill the hot melt supply unit often enough, there can be insufficient time to melt and condition the adhesive. this results in equipment down time and employees waiting untill the hopper temperature returns to setpoint. Easily integrated into most standard ITW Dynatec and competitive hot melt units. Minimizes adhesive contamination for increased uptime. On-Demand adhesive replenishment saves operator time and prevents thermal shock to the adhesive. Automatically feeds hot melt units up to 20 feet vertically and 100 feet horizontally. Installation of an auto feed system reduces all of the above problems. The result is lower repair costs and higher production rates.